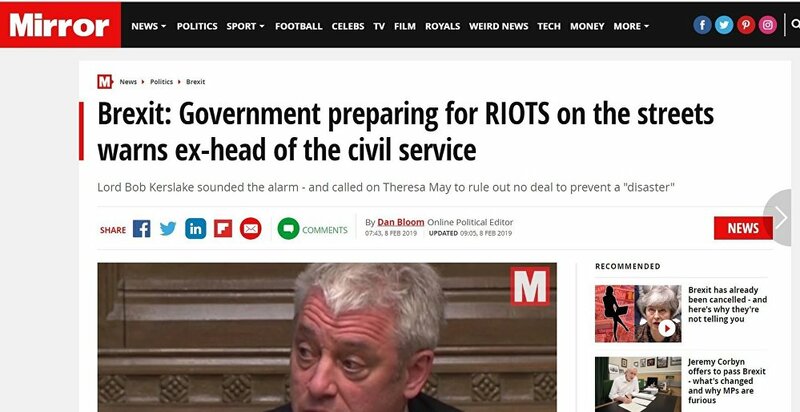 Referring to the comments by the former head of the UK civil service, the newspapers noted that such measures date back to the Cold War and snatched the opportunity to capitalize the word 'RIOTS,' presumably for greater effect. 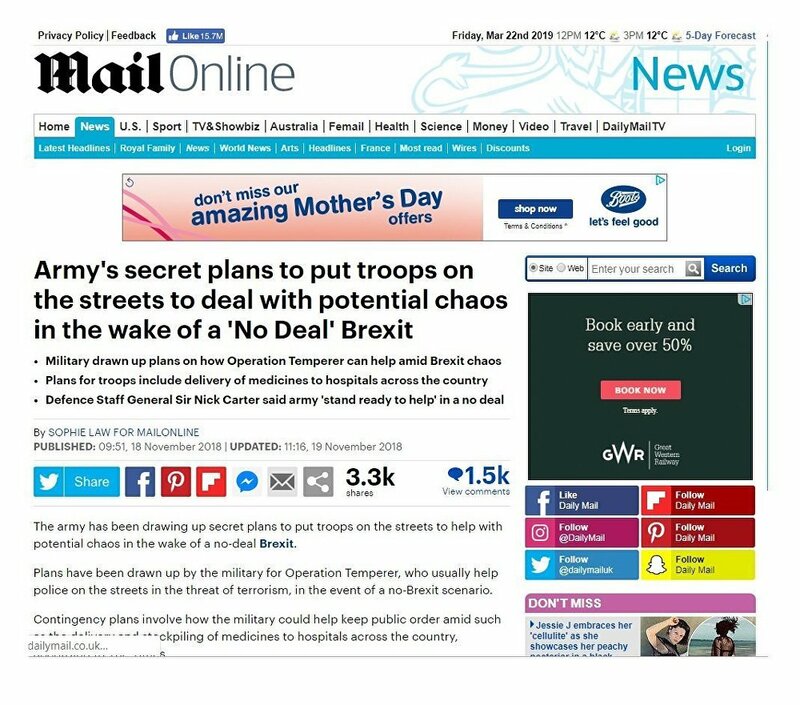 Chilling scenes of UK army taking to the streets to help with potential chaos in the wake of a no-deal Brexit have been depicted by Mail Online, the online edition of the Daily Mail newspaper. 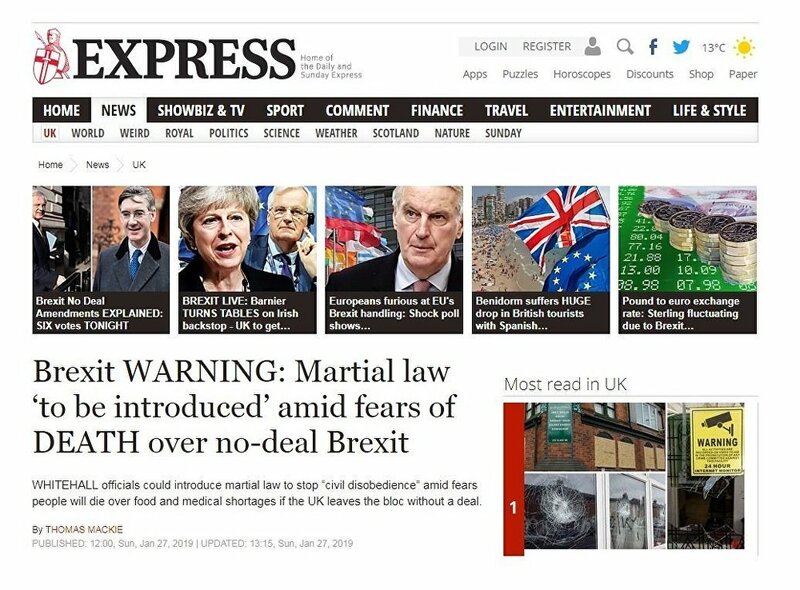 Meanwhile, the Daily Express stressed in its "WARNING" that martial law could be introduced in the UK fears of "DEATH" over no-deal Brexit. "Government staff are looking at introducing legislation under the Civil Contingencies Act 2004 which would allow ministers to impose curfews, travel bans, confiscate property and deploy the armed forces to stop rioting. They can also amend any act of parliament, except the Human Rights Act, for a maximum of 21 days," the Express said, citing a Whitehall source. Brexiteer and former UKIP leader Nigel Farage criticized the "scaremongering" martial law claim, arguing it was "wholly irresponsible" on the government's part to put out this type of message, which was then quickly picked up and circulated by the media. 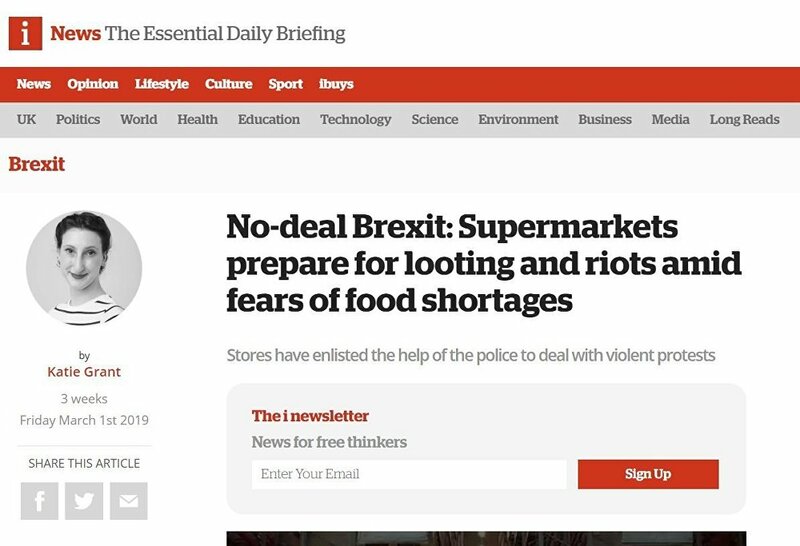 Fear of empty supermarket shelves has also been largely mulled by the British media, writing about the hard-hitting consequences of a no-deal Brexit. 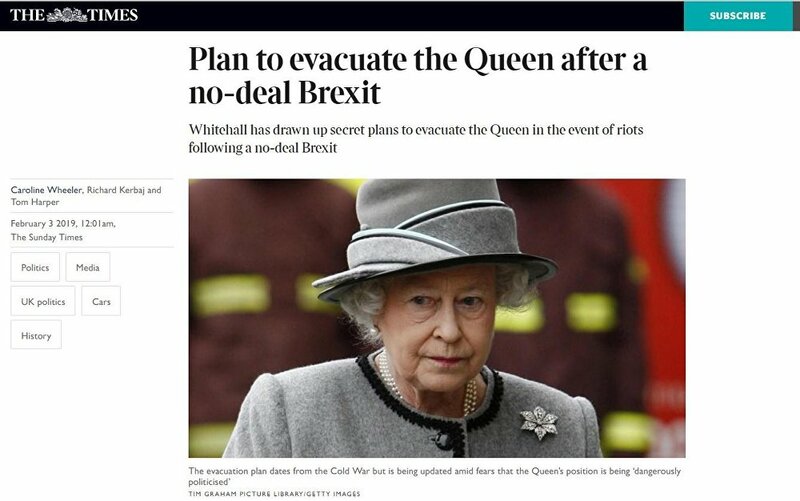 Reports in the media said that Brits were stockpiling on toilet paper and painkillers, among other items, in preparation for a ‘clean exit.' At the same time, supermarkets were reported to prepare for "looting" "amid fears of food shortages." "Stores have enlisted the help of the police to deal with violent protests," the i News said. In one of the latest reports, covering Theresa May's negotiations with EU leaders at the European Council Summit in Brussels, a Financial Times headline read: "May Faces ‘National Emergency' as EU Haggles Over Brexit Guillotine." The paper referred to an apparatus designed for efficiently carrying out executions by beheading, a popular method judicial execution in France in the past, while referring to the cut-off date for Britain in mid-April — a fresh deadline for the UK government to make a decision. Terms, such as "chaos," "mess" and "nightmare" have been very common in mainstream news headlines, covering Brexit negotiations and the no-deal scenario. Another phrase used by the press referred to "battle plans," implying that a no-deal Brexit would be akin to war. The UK faces a tough choice, following the latest talks in Brussels, between the current Brexit deal and different extension deadlines, conditional on the approval of the deal and the agreement to participate in the European Parliament elections in May.